Herausgeber*in(nen): Billett, Stephen; Dymock, Darryl & Choy, Sarojni (Hrsg.). 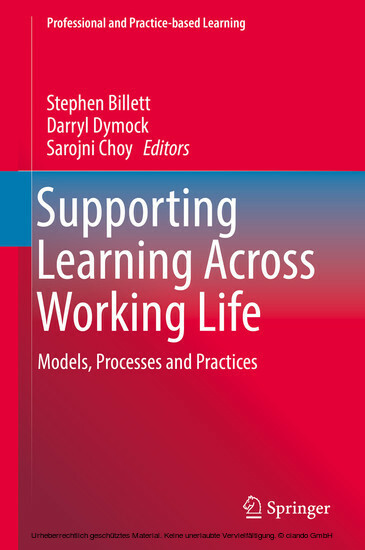 This volume considers, rethinks and reorganizes how support for learning across working life can be best conceptualized, organized and enacted. It considers educational and learning support processes that include approaches that fit well within working lives and workplaces, and support work and learning as a co-occurrence. These are the key focuses for individual and collective contributions to this edited volume, which provide discussions about what constitutes learning across working lives and how this differs from lifelong learning and lifelong education. Accounts of learning across the working lives of social workers, doctors working in hospitals and in general practice, teaching, aviation, nursing, mining, aged care and more. These accounts advance a range of ways in which workers’ learning across working lives is being supported and how this support is also linked to other changes, such as to the occupational practice in which they engage. Billett, Stephen; Dymock, Darryl & Choy, Sarojni (Hrsg.). (2016). Supporting Learning Across Working Life. Models, Processes and Practices. Cham: Springer VS. DOI: 10.1007/978-3-319-29019-5. Abgerufen von: http://www.ciando.com/pictures/bib/3319290193bib_t_1.jpg.